If you know anything about theatre in Cincinnati, you’ve been hearing about HANDS ON A HARDBODY. There are posters everywhere for it; the catchy title and intriguing premise (10 people stand in the hot sun, holding on to a truck, hoping to be the last one standing in order to take it home) have caused a lot of hype. If I had to list the top five shows I’m excited about this fall, this one would have been on it. A good friend of mine – who doesn’t usually rave about anything – texted me after the pay what you can preview on Monday night absolutely gushing. So, my expectations were huge. Of course they were, with a cast list like this. Direction by THE D. Lynn Meyers? I’m there. Choreographed by the sensational Patti James? Um, yep. Musically directed by the marvelous Scot Wooley. Oooo, yessir! This has to be a hit, right? Well, if the run isn’t extended due to sales being through the roof, then something is terribly wrong with the world. This is a spectacular theatrical production and should be seen by everyone in town. There’s a lot of folks on stage; too many to mention them all but I was very impressed with the work of Charlie Clark as “Benny Perkins.” He set the tone at the outset that this was going to be a different kind of show; it takes a real pro to make a character this unlikeable work and Clark had the audience on his side immediately. One guy two rows behind me even laughed quite inappropriately at one of Benny’s most villainous moments. In one of the bravest performances I’ve ever seen, Jim Hopkins (who stepped into the role this morning as a last minute replacement) kept up with his bombastic counterpart, Deb G. Girdler, in impressive fashion. If I hadn’t known the back story on his casting, I wouldn’t have known he was new to the show. He’s a true professional in action. This show is funny; but the comedy isn’t the point. I’m sure this show is often lumped into the same category as “The 25th Annual Putnam County Spelling Bee” and there are definitely similarities. But while the Bee is mostly about the laughs, this show is darker, more serious, with people who are all grown up and are now desperate. They need this truck; its not just a prize for them. Their livelihood is on the line. 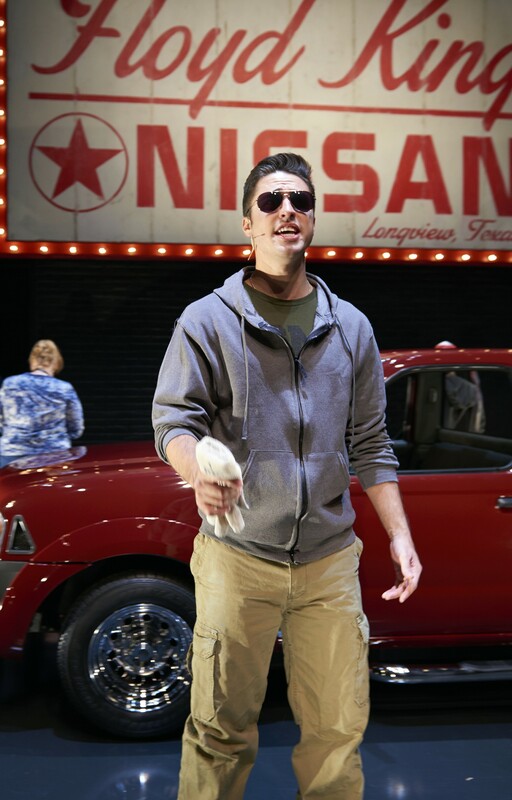 Recent CCM musical theatre graduate and wonderful performer Jordan De Leon plays the veterinarian student, “Jesus,” who needs the truck in order to finish school and fulfill a dream. But even more desperate, in a much more reserved way is “Chris,” played by current CCM senior Dallas Padoven. Padoven’s role is the smallest of the contestants but he milks every single second of stage time with his stoicism, brooding and building anger, and show stopping song “Stronger.” I may have a bias here, but the audible reaction from the folks sitting around me was enough evidence that this young man takes full advantage of his acting training to create perhaps the most moving moment in the show and definitely in all of Act One. The show builds to a slow climax, but a touching one. I won’t ruin it for you though I think you’ll be surprised who wins the truck. But, as we learn through the finale, its really not about winning. . . it’s about keeping your hands on what you love and never letting go of your dreams. If that’s not up this sappy critic’s alley, nothing this season will be. 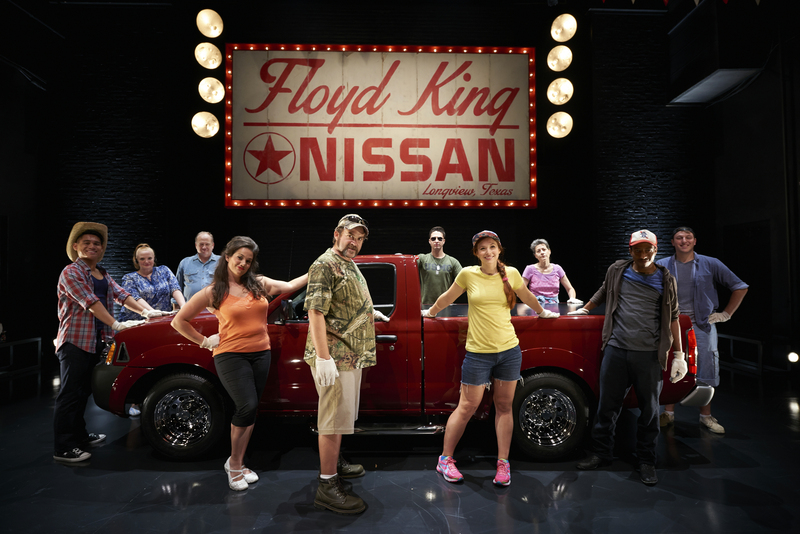 HANDS ON A HARDBODY runs through September 21st at Ensemble Theatre of Cincinnati on Vine Street. Tickets and more information can be found here.